Jonas Rask Design has created a set of beautiful 32 x 32 px toolbar icons. He has decided to release these free for developers and private individuals alike. You can use them in your applications, in your toolbar, on your website. It’s entirely up to you. A credit or backlink is not required but appreciated. Package includes ICNS,PNG, TIFF, Mac Icons and Pixadex iContainer versions. Enjoy. Have you thought of using a set of round social bookmark icons? Vikiworks released a collection of social web application icons including Flickr, Digg, StumbleUpon, WordPress, Furl, Twitter, Windows live, Blinklist, Blogger, Lifelogger and etc… All icons are sized to 64*64 in PNG format and it’s great to use them on your website or blog. The whole collection is divided into two parts, Social Bookmark Iconset Part I and Social Bookmark Iconset Part II. Yesterdat I was surfing on the internet and found this. It is time to have a fresh look of your feed icons. Zeus Box Studio released a set of gorgeous Feed Icons. It contain 34 icons in 32 and 16 pixels size. The icons use PNG format. They are licensed under Creative Common 3.0, you may use them in your website and projects. Fast Icon released many sets of quality icons. The FastIcons’s Free Icons are available for download as standard Mac or Windows icons as well as a handy PNG files for Linux, web or blogs. They are FREEWARE and property of Fasticon.com. You have to maintain an operable link to www.fasticon.com. Does your web application have international appeal? Do you support multiple languages? Do you need a set of Flag Icons? Icon Drawer produced more then 220 flag icons representing countries and unions all over the world in PNG format. Sizes : 16×16, 24×24, 32×32, 48×48. They look so pretty. Icon Drawer also produced Mac OS X application icons such as Chess, GarageBand, Quick Time Player, Mail, Pages, Preview, iChat, iPhoto, iTunes, Address Book, Text Edit, iCal in black and blue colors. If you wish to all these icons on your website/web application, you need to place link Icon Drawer on your site. (Somewhere on static first level page, not in blog or news page). 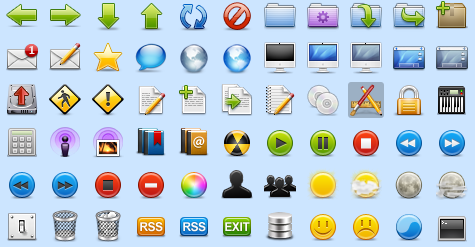 Other than Tango Top Quality Vector Icons, there is another set of professional high quality icons – GNOME 2.18. GNOME 2.18 Icons are in PNG ( Transparent background which can easily integrate into any web site) and SVG format ( Scalable which means you can increase the size of the icons without losing quality. There are over 600 icons altogether. I think this is one of the best icon sets I have ever seen. Are you tired of using some small and ugly web 2.0 services icons? You should try the Web 2.0 Services Icons Pack which is made by Made by ilemoned and miniajax. They looks amazing and all in PSD and PNG formats, it is very easy to modified and blend it to your website. IconBuffet is home to a tasty plethora of free icons. You’ll get one free delivery a month just for being a member at IconBuffet. Collect them, download them, trade them with your friends. You’ll earn badges as you send and receive sets, make friends, and invite others. You can more points by sending icons to friends and get badges. If you build up enough points, good things can start to happen. You’ll unlock extra features on the ’Buffet and might even earn some bonus tokens for more icons. You can use all icons you have got on any non-commercial or commercial websites. Matt Ball is a student currently attending UCLA with a major in Computer Science and Engineering. He spent some of my spare time designed a set of good looking toolbar icons for us. These toolbar icons are very suitable for developing web applications and services. Famfamfam offers us a set of wonderful and most pupular icons on the internet named “Silk” which contains over 700 16-by-16 pixel icons in strokably-soft PNG format. And all for a low low price of $0.00. You can’t say fairer than that.